Bedding plants are often on sale quite early in the year from March onwards and the temptation is to plant them out. Generally, because bedding plants are tender, which means they are not frost hardy, which means do not plant them out until the risk of frost has passed. As a rule of thumb most areas of the UK are frost free by the end of May which means, although it is tempting to plant out earlier, it is bet left until May. You can plant out earlier provided you are ready to cover with fleece or cloche in the event of a frost. Knowing if a plant is fully frost hardy or not will also help when selecting plants for the garden. If you have a greenhouse or lean to and can shelter plants under glass, it is a good idea to plant up a hanging basket or tub and grow on in the greenhouse. This will give the plants time to settle and establish roots in the container. Bedding plants which have been grown on under glass will need to be "hardened" off before planting out. This means getting the plant accustomed to the outside conditions and not moving it straight out from the calm, still and warm greenhouse conditions to the less perfect outside weather. Move the trays of bedding plants outside, starting on milder days and leaving out for longer as the weather improves until they are out all of the time and fully accustomed to our weather. 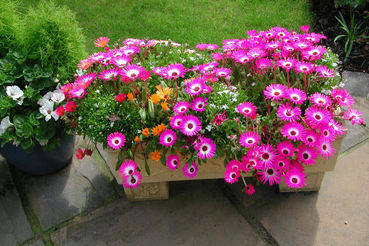 Bedding plants have to grow a lot and put up a good show of flowers in a short period of time over a few summer months. From this it follows they do best in really good compost and will always benefit from a feed during the growing season. Dead heading is also essential to keep bedding plants flowering. In summer when in full bloom, dead heading may need to be done several times a week depending on the plant. Some bedding plants are easier to grow and less maintenance than others. By way of example, Mesembryanthemum common name ice plant is a fabulous showy bedding plant, 4th image bottom left, but look at the dead heads in the image next to it removed in just one day. If a plant is not dead headed, it will cease to flower, but taking off 50+ spent flowers is very time consuming. Compare that with Pelargonium, image 3 top right, which needs much less dead heading and Nasturtiums, 1st image top left, hardly need any attention. Some bedding plants have a tendency to become leggy with lots of stems and not enough flower. To prevent this, particularly at the beginning of the growing season, and periodically during the summer "pinch out" the growth point to make the plant bush. This is shown in the images below and the plant in question is a Petunia does have a tendency to become leggy. There are not many bedding plants which are slug resistant. Bedding plants and slugs together, because some bedding plants are slug magnets, for example Marigolds. On the list also Petunia, Verbena, Nicotina, its a long list because most bedding plants with tender young growth are attractive so you need slug protection. Tips on slug protection and how to repair a slug ravaged plant. If the slugs do eat most of your Petunia, don't despair it maybe capable of rescue. Slugs do not show a lot of interest in Pelargonium, Fuchsia, Calendula is a good alternative to Marigolds which slugs love. Nasturtium are good, Lantana too which is also very attractive to bees and butterflies; its not a very long list. To grow a wider variety of bedding plants check out ways to beat the slugs. Accept you will loose some plants and have some "spares" in the greenhouse. Also consider mixing tubs of bedding with less hardy perennials such as the French lavender and Heliotrope which are less attractive to slugs. Thompson and Morgan has a great selection of quality Bedding plants from small plugs to Garden Ready Plants - Get ready for summer Garden Ready plants, super-sized plants, despatched at the perfect time for planting out, enjoy a longer, stronger display of flowers, plant out in to the garden, containers or hanging baskets. Weekly offers on all plants including bedding plants .